The November 23rd Monday Morning Meeting was abuzz with excitement at Sandown North this week as students, staff, and family awaited the “great unveiling” of a project that each member of the school played a part in creating. All Sandown North students, in grades one through five, had an opportunity to work for three days with the famous artist, Rob Surette. 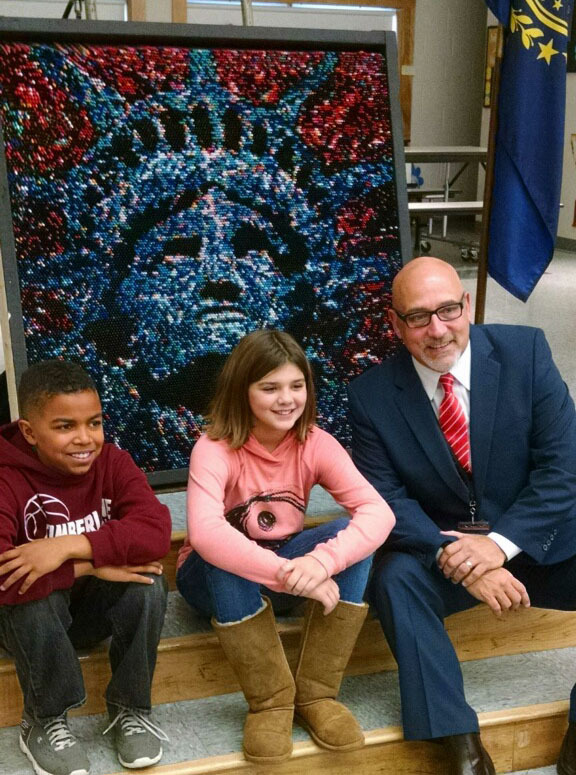 Together they created a crayon sculpture using more than 23, 000 crayons. Each student, with guidance from Rob, placed a handful of crayons in a designated spot on the sculpture. Students played a part in creating the whole but were not told what the art piece would be. Rob finished the sculpture and students unveiled the Statue of Liberty today to great applause. Each year the students of Sandown North return to school and learn of the new theme the teachers have decided will be the connecting link for the work for the year. This year the theme took on even greater importance as students in grades 4 & 5 are being educated at North for the first time. Staff members had agreed on the theme of peace and the motto of: Peace, Learn, and Grow. Evidence of the theme can be seen on doors, in the hall, and in classrooms. The Statue of Liberty sculpture, created as a school community, was thought to be the ultimate representation of a peaceful nation, of a peaceful beginning not only for those who came to our country, but also for the students of Sandown North, who have come together in learning. Just as the sculpture was being completed, the tragedy in France occurred. The Sandown North community will certainly proudly display this sculpture in the main hallway but will dedicate it to the people of France, the same people who gave the United States the Statue of Liberty. Students would like all to remember that much can be accomplished when people work together peacefully.